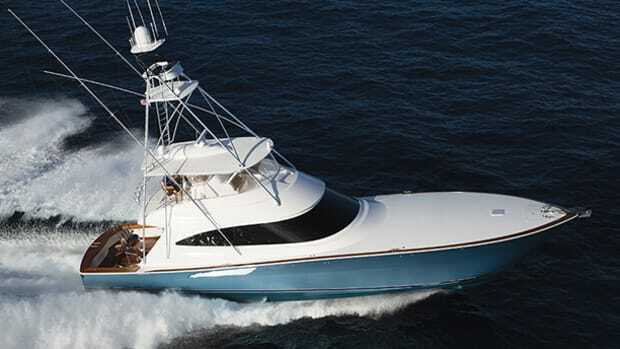 This 70-footer was born to run hard and fast, turn on a dime, and chase big fish. A sleek feature line is worth a thousand words. That was my first thought as I gazed at the superstructure of the Viking 70 Convertible lying quayside in Riviera Beach, Florida. Like all Vikings, she had a sleek and aggressive look, but the razor-sharp feature line that ran from the front of the house to the cockpit enhanced it further, seeming to lower her profile and make her look even tougher than her predecessors. It was a clear illustration of what this boat’s all about. Backing up that muscular appearance and nearly 100 inches of wave-busting forward freeboard is 46 years of proven construction technique. The 70 sports a completely cored hull using end-grain balsa to help both reduce weight and add shear strength. Adding backbone are foam-cored, fiberglass-encapsulated stringers. Foam coring is also used in all the high-gloss teak cabinet doors. (Satin finish is also available.) Although Viking still does a lot of hand lay-ups, many parts, including the engine-room and forward bulkheads, are infused. 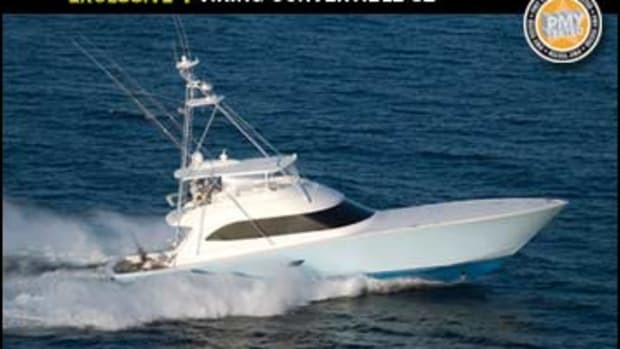 Viking’s tough build is as well known as its ability to run fast. 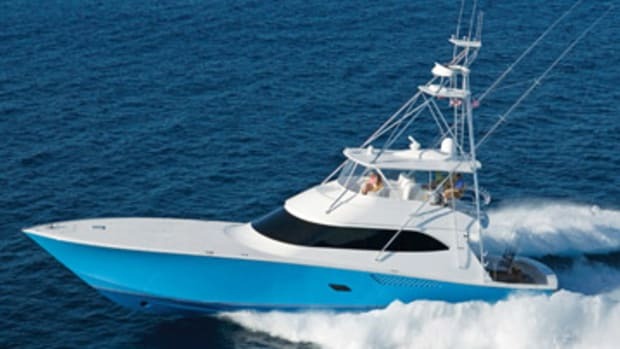 To ensure that the 70 would be first off the line in a Bimini start and the first one back at the docks to weigh-in, the builder equipped my test boat with 2,600-hp MTU M94 diesels, an $899,000 upcharge from the $3,742,000 base price. (A variety of other diesels from MAN, Caterpillar, and MTU starting at 1,550 hp are also available.) So how fast would she go? To find out, Capt. Ryan Higgins and I took the 70 out through a flat-calm Palm Beach inlet with the big iron loafing at 1750 rpm. 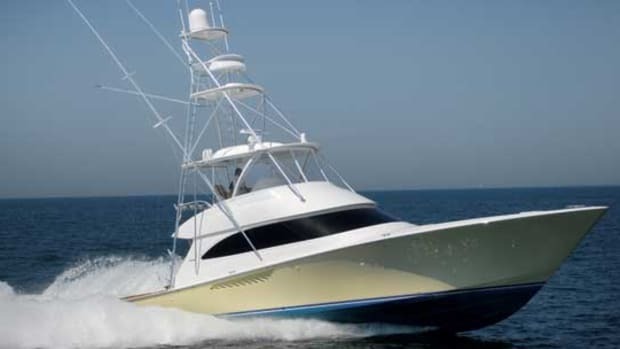 With just a 67-percent load, the MTUs were effortlessly pushing this boat along at 37 mph (32.2 knots) while burning 130 gph. 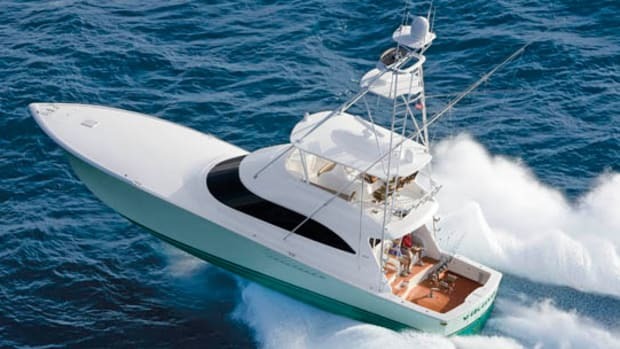 Based on a 2,700-gallon fuel load (my test boat was equipped with an optional 600-gallon tank) and a ten-percent reserve, the 70 can make that speed for 692 statute miles. But those MTUs can spool up to 2450 rpm, and at that speed, our 70 actually broke the half-century mark with an average top speed of 50.3 mph (43.7 knots) and a 274-gph fuel burn, which still provides a 446-statute-mile range. 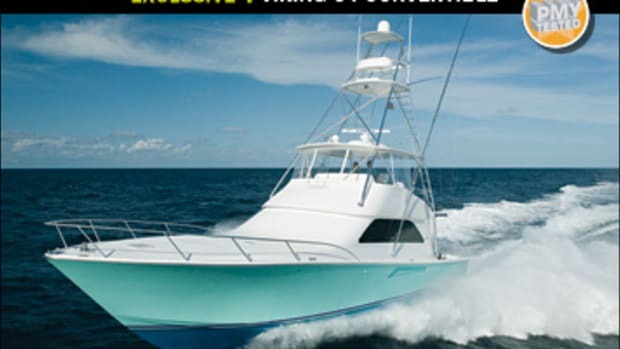 A good compromise comes at 2000 rpm and 78-percent load, which yields 43 mph (37.3 knots) at 172 gph though Higgins prefers 2100 rpm (about 80-percent load) and 39 knots (44.9 mph). He told me that this summer he did 150-mile day trips to fish the canyons south of Cape May, New Jersey, at this velocity. “It’s like the same as doing a 90-mile day trip in a 30-knot boat,” he says. Simply put, she’s fast. Not only is she speedy, she handles like a sports car, partly because of VIPER, Viking Independent Programmable Electro-hydraulic Rudder, steering. The system’s software adjusts the rudder offset (called toe) for better, sharper turning and responsiveness and superior tracking. When I pushed the standard Sturdy single levers until the MTU LCD readouts showed 2100 rpm and put the wheel hard over, the 70 leaned moderately to inboard and cut a perfect two-boat-length circle like a diamond cutting glass. And when I centered the wheel, she took off like a Kentucky Derby three-year-old. The fact that the 70 doesn’t dig a big hole and her wake is nearly flat when making this maneuver can be attributed to her hull form, which in addition to its convex shape and fine entry, transitions to an 11.8-degree transom deadrise. The flat aft section helps with that lift-and-launch feeling coming out of a turn and when pushing the throttles to the pins. But the shape maintains enough deadrise transitioning from bow to stern so that if she catches a wave back on her hull, you shouldn’t experience any spine-compressing slamming. This battlewagon’s speed will come in handy on tournament day, which this boat was truly built for. From her 206-square-foot cockpit and optional Murray fighting chair to her in-deck livewell, mezzanine bait stowage, freezer, and more, the 70 can chase the big ones—anywhere. 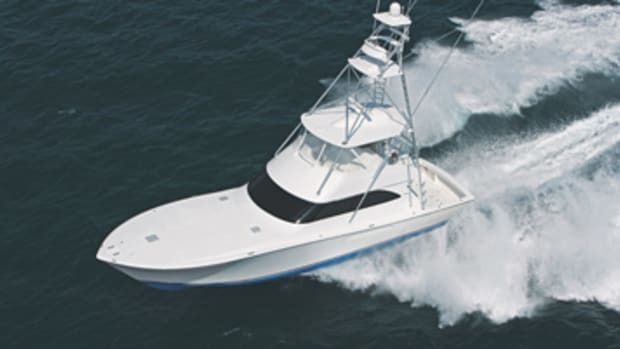 But don’t take my word for it: the boat I tested had already logged 400 hours, including several solid tournament finishes this season as Viking’s team boat during which her crew managed to raise, catch, and release 53 white marlin in a 24-hour period in early September. 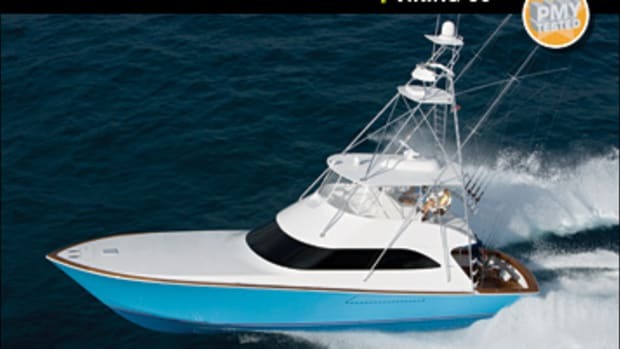 So while many boats say they can raise fish, this one has the flag-filled optional Rupp hydraulic outriggers to prove it. Tournament teams will appreciate the standard accommodations layout, which offers two sizeable (6&apos;3"x3&apos;1") crew berths adjacent to the engine room and three more staterooms, including an amidships master to port. Two more staterooms, one with bunks (to port forward of master) and a queen-size-berth-equipped forepeak one, round out the setup. 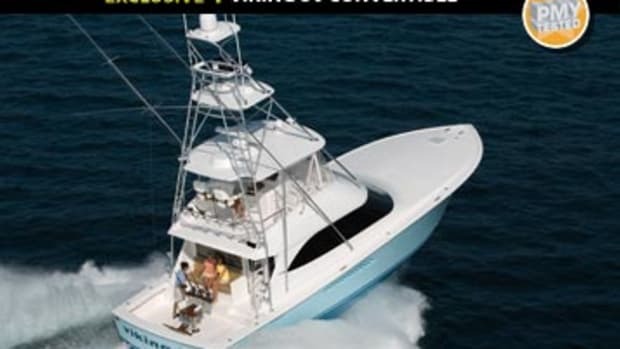 With the flying-bridge helm setup, which features an optional Furuno NavNet 3-D system, that massive cockpit, and enough speed to get anywhere in a hurry, the Viking 70 is one of the most complete bluewater fishing packages I’ve come across. Looking back at how many words it took to tell this boat’s story, I guess a sleek feature line really is worth a thousand words. 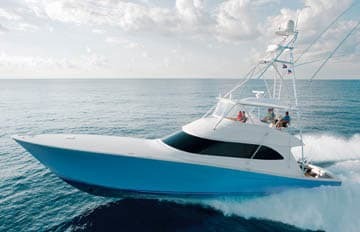 And if you’re in the market for a boat built to fish, the Viking 70 is well worth your attention.